The resolution test of the Nikkor AF-S 85 mm f/1.8G (understood as MTF50 function values) was based on RAW files from the Nikon D3x. The measurement errors ranged from 0.3 to 0.9 lpmm. 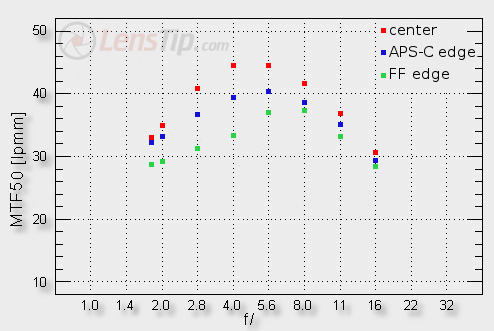 The results the tested lens reached in the frame centre, on the edge of the APS-C sensor and on the edge of full frame are presented on a graph below. 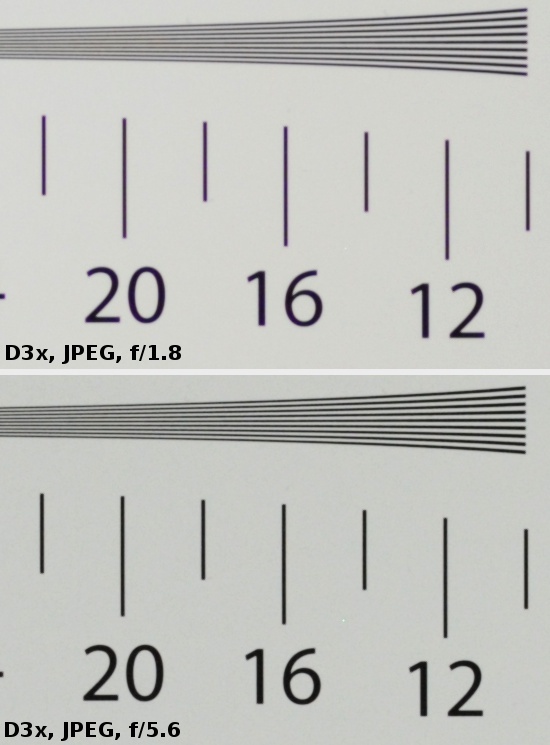 Before we go into details let’s remind here that in case of tests conducted on the D3X a decency level is situated around 30-31 lpmm and the best fixed-focal lenses can reach the values of 45-46 lpmm. The Nikkor’s 1.8/85G results compare very well here. In the frame centre, already at the maximum relative aperture, you get fully useful images; after stopping down to f/2.8 you are able to enjoy very sharp photos indeed. The highest results, exceeding the level of 44 lpmm, the lens gets by f/4.0 and f/5.6. You have a full usefulness at the maximum relative aperture and brushing against record values on stopping down – you couldn’t expect more from an amateur lens. Equally positive things can be said about the performance on the edge of the APS-C sensor. Even at the maximum relative aperture the image is fully functional and after a slight stopping down its quality becomes very good. A bit worse situation can be noticed on the edge of full frame. In that case by f/1.8- 2.0 you just brush against the decency level and you see it exceeded only near f/2.5. These results show that the f/1.8 model, when compared to the more expensive f/1.4 construction, has nothing to be ashamed of. What’s interesting, in the centre of the frame the cheaper Nikkor 1.8/85G fares actually a bit better. It is worse than the fastest Nikkor on the edge of the frame. Below we present some crops taken from our resolution chart’s photos, saved as JPEG files.